The above scenario has happened to me. Leaky containers are a huge pet peeve of mine. Like the popular meme goes, “Ain’t no one got time for that!”. In my experience, it’s usually a loose lid that pops off in transit. It’s very frustrating! 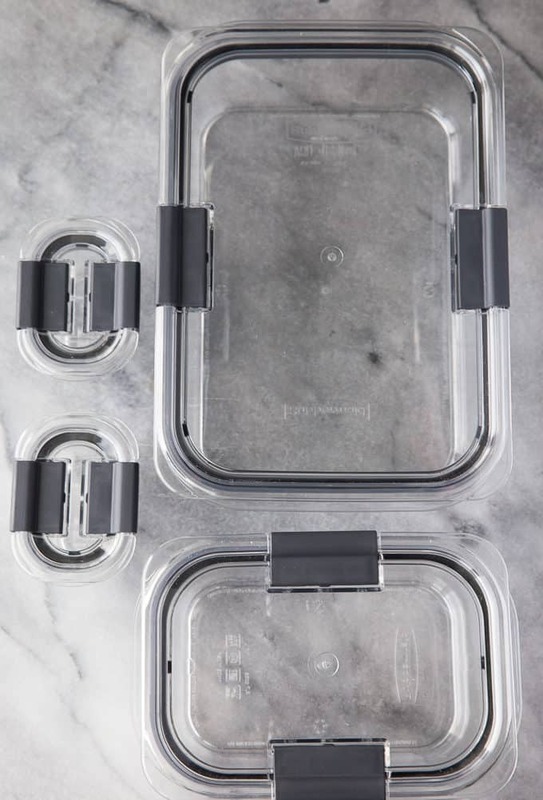 I was happy to discover Rubbermaid’s BRILLIANCE food storage containers and have been using them exclusively for the past several weeks to store my homemade sauces, dressings, marinades and more. If you see me transporting food anywhere this summer, I’m using these containers! What I like most about BRILLIANCE is that they are 100% leak-proof. I’ve tested them out and nothing is escaping them! The lid seals on air-tight and isn’t going anywhere. My recipes stay fresh and safe and are transported in perfect condition. The BRILLIANCE containers are sleek and clean with a crystal-clear design. At first glance, you’d think they are made of glass, but are actually made from a material called Tritan – which makes them lighter than glass and highly durable. Tritan is also stain and odour resistant, to keep your containers looking (and smelling) new even after you’ve used them on a regular basis. They are also microwaveable, with built-in vents in the lid. This week, I heated up some leftover chili in the microwave for dinner in the large BRILLIANCE container. Just keep the lid on, but not sealed (with the latches in the up position), to keep the container vented and prevent microwave splatters all at the same time. 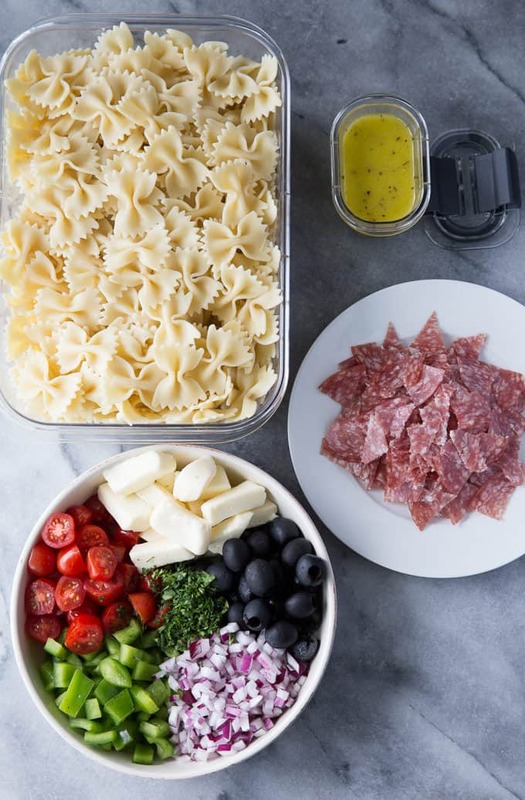 I put these containers to the ultimate test: an Italian Pasta Salad with Homemade Italian Vinaigrette. I wanted to make the leakiest recipe I could think of and it fit the bill to a T. A friend of mine invited me to her house for a BBQ. She knows I love to cook and asked me to bring a dish with me for dinner. 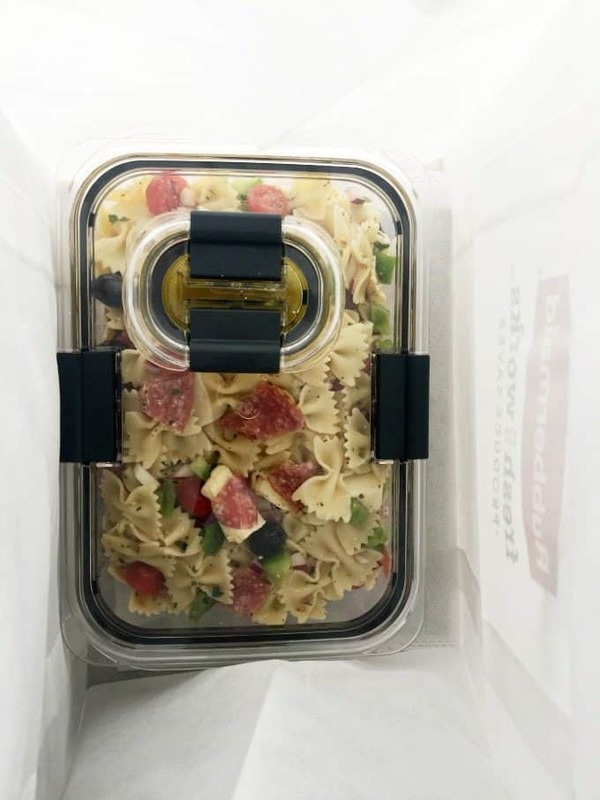 The large container stored the pasta salad and the mini was the perfect size for transporting extra vinaigrette. If you wanted to save time, use store bought Italian dressing. However, I think you’ll find my recipe both easy to make and tasty. Use whatever kind of noodles you have on hand. I like the look of the “bowtie” noodles for pretty presentation. Add in your fresh veggies including cherry tomatoes, green pepper, onion and garlic. To keep with the Italian theme, I also used salami, black olives and fresh mozzarella cheese. My mouth is watering just thinking about this pasta salad! I think my favourite part of this salad is the flavourful dressing! I make it often to use on salads and as a marinade for chicken. It adds so much deliciousness! I packed up the pasta salad in the Large BRILLIANCE container and put some extra dressing in a Mini BRILLIANCE container. I like to bring extra to add a little before serving to help keep the pasta from sticking together. 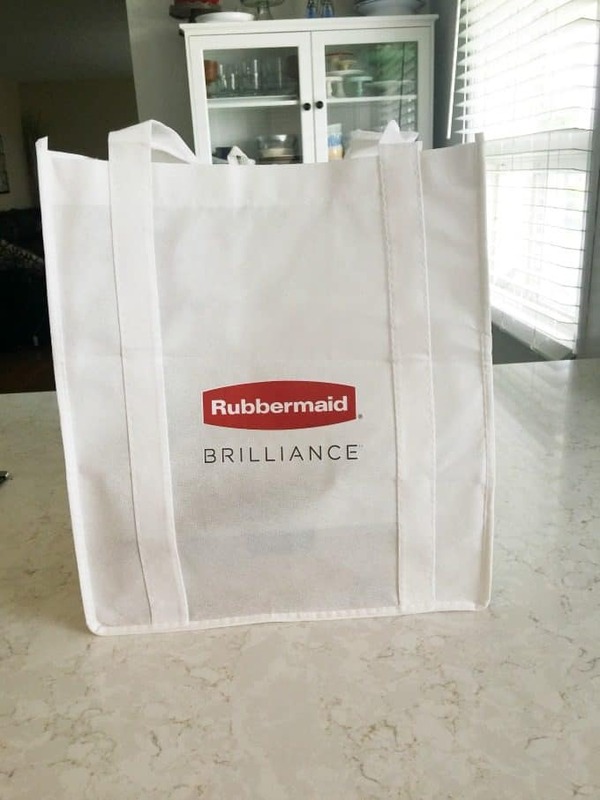 Rubbermaid sent me a white tote to carry my leakiest recipe in. I packed up the pasta salad in it and headed on my way. I’m happy to report that the pasta salad fresh and most importantly, contained! When I got to my friend’s house, I took it out of the bag and put in her fridge. The bag looked as good as new and no spills anywhere. Success! My friend asked where I got my new spiffy looking containers and I told her she had to try them. She brings a lunch with her to work and had the same issue as me with the lids not staying on. I mentioned where she could find them (Walmart, Loblaws and London Drugs for $5.99 – $13.99 depending on which size you buy) and to give them a try. Visit Rubbermaid to learn more! What leaky recipe will you store in your BRILLIANCE containers? You might also like this Tortellini Salad, Chicken Caesar Pasta Salad or Macaroni Salad. 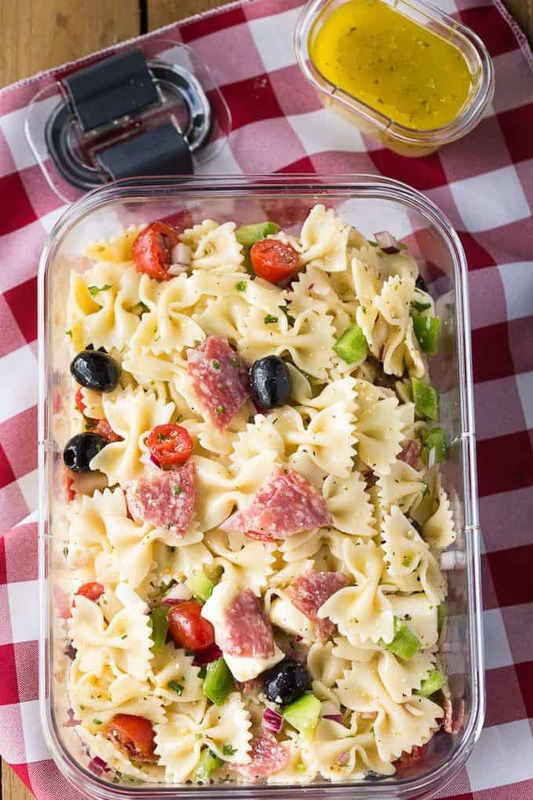 Packed full of deliciousness, this pasta salad will be a hit at your summer gatherings! Cook pasta according to package direction. Drain and set aside to cool. 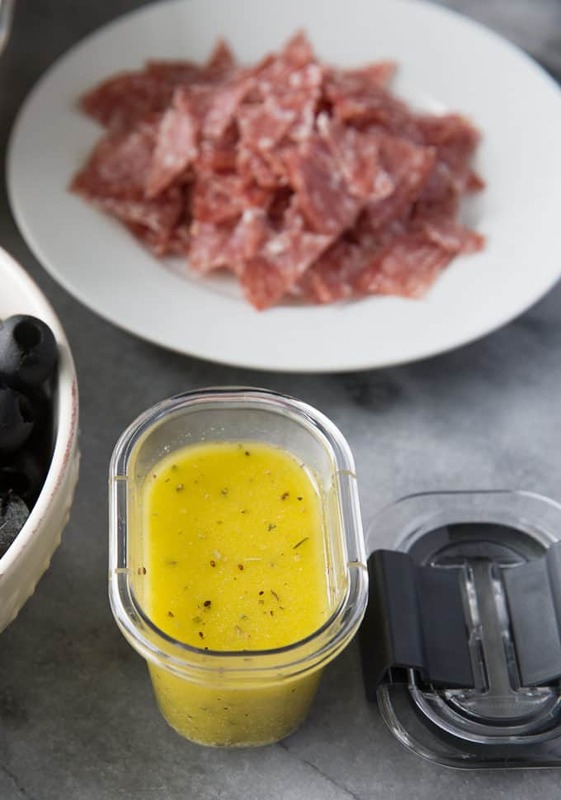 Add mozzarella, black olives, cherry tomatoes, parsley, red onion, green pepper, salami and cooked pasta to a large bowl. Toss to combine. In a smaller bowl, whisk together Italian vinaigrette ingredients. Pour into pasta salad bowl and toss to cover. Refrigerate until ready to serve. Connect with Rubbermaid on Facebook, Instagram, Twitter and YouTube. Disclosure: Product and compensation was provided to me by Rubbermaid. All opinions expressed on this blog are my own. I love these Rubbermaid containers. I use them all the time, and they keep my food so much fresher. I love this lighter take on pasta salad. Pasta salad can be so good, but I don’t like how heavy the creamy varieties are. Thanks! I absolutely love Rubbermaid, and these containers are fantastic. 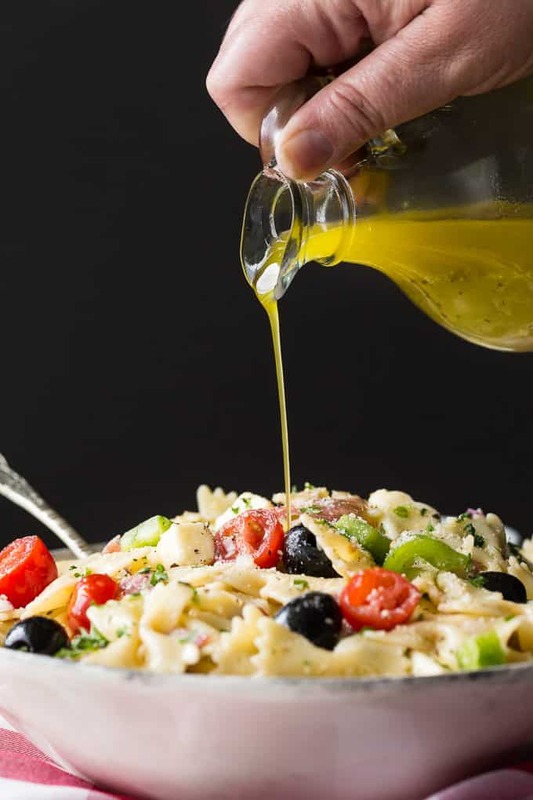 Your pasta salad recipe looks delicious as well. Everything you MAKE is brilliance remastered!!!! I need these kitchen goodies in my life, STAT! Yum! Pasta salad is one of my favorites! This looks amazing! 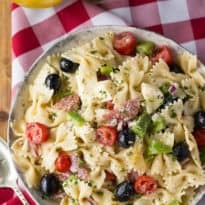 I make a very similar pasta salad and it’s always a hit when I host cookouts. My friends and family usually request it. What a great product from Rubbermaid! Spilling our food that we bring to a family get together is always a worry, but these would be a life saver! I love your pasta salad recipe! Thanks for the lovely recipe it will be perfect for the next potluck ! I really like these containers. There’s nothing worse than having something leak all over. Your salad looks mighty yummy too. Gosh sounds like the best pasta salad! I totally need to make some for myself! I’m loving the new storage containers! I love that the salad as some meat in it. I am saving the recipe because it sounds delicious..
Looks great! Will make it! Thanks! My containers are getting old and need to be replaced. I will have to look for these Brilliance containers. They are exactly what I am looking for. I like the look of these Brilliance containers. It is easy to see what is inside without opening them. I will have to give this recipe a try. This recipe looks so delicious and easy to make. I will have to get the ingredients I need and add it to my meal plan for next week. I am always looking for new recipes to try. That pasta looks amazing. I have got to give this a try soon. I also really like those containers. I have some from Rubbermaid, just not these ones. I really need some new containers and those look great. I would store jello salad in it since that seems to get runny,. 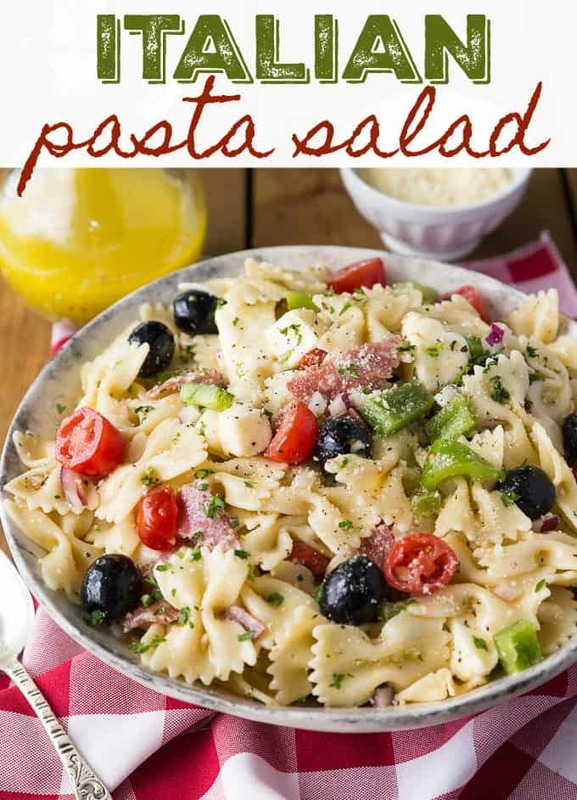 I’ve been looking for a great pasta salad recipe and this one looks delicious! And I always need more containers! These look perfect for transporting food for potlucks. I love this salad . It’s one of my favorite. Love the containers. Yum! 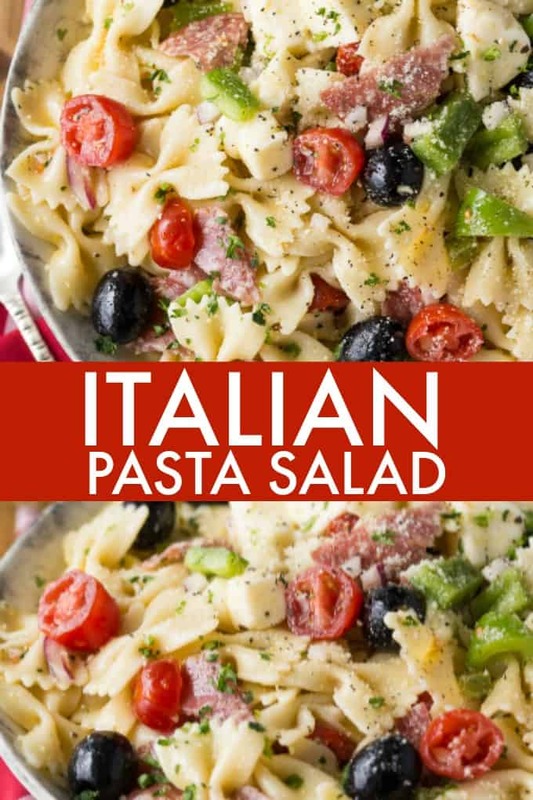 I’m always looking for a good pasta salad recipe and this sure does sound good. Gonna have to try it. 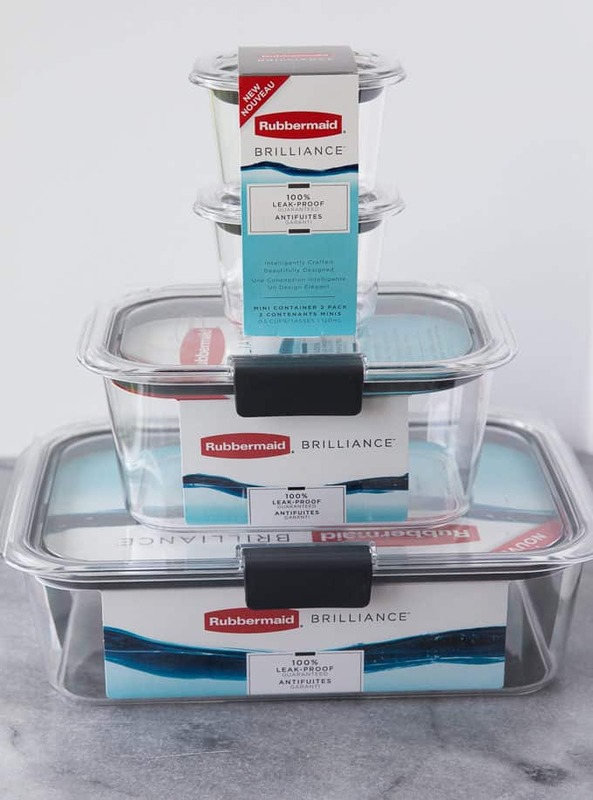 I really like the Brilliance line from Rubbermaid. They look so nice for serving food and are totally spillproof as I found out after tripping while holding one full of food! Your pasta salad looks delicious by the way. I can always use a great pasta salad recipe. Great containers and recipe! I’m definitely getting myself a set. Your Pasta Salad looks delicious! I love these containers and I would put my watermelon recipe in these containers and take to the lake. Your pasta salad looks delicious, the containers are nifty too, what fun to review and to save your ingredients!!! Your Italian Pasta Salad looks delicious, we will really enjoy it! Thanks so much for sharing your post with us at Full Plate Thursday and have a great weekend! The pasta salad looks delish! 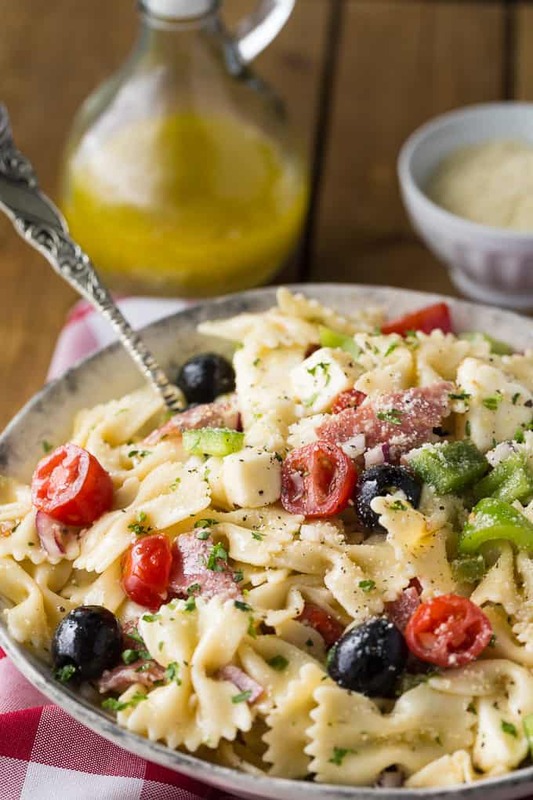 Love the combo of garlic, olives, tomatoes, & pepper in a vinaigrette dressing! The containers look impressive too…finally something plastic is microwaveable? Spatter-proof too? Unbeatable, I’d say!. Thanks for sharing with Sweet Inspiration! 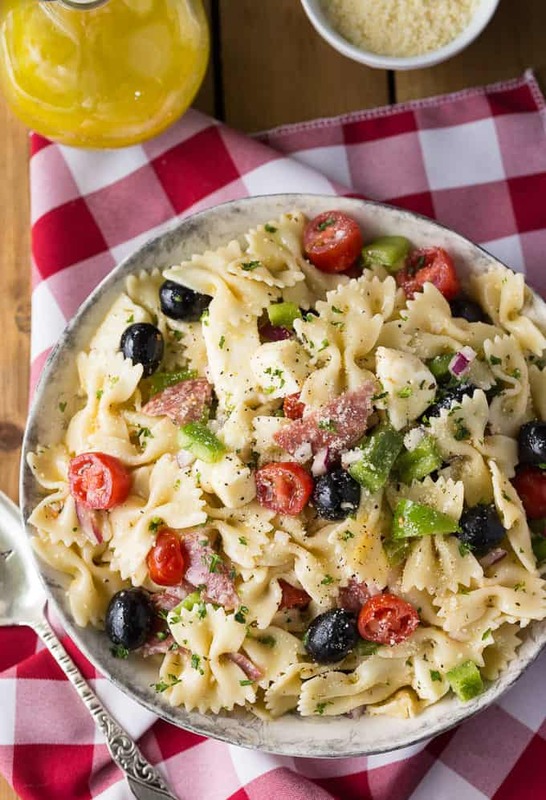 This pasta salad looks delicious! I will definitely give this recipe a try. Thank you for sharing! Love the pasta salad! It looks so fresh and tasty! The containers are fantastic too! I will be on the look out for them in the store! Thanks so much for sharing at Celebrate It! This recipe looks and reads delicious. I am going to have to give it a try. I will also have to try the Rubbermaid containers. They look like just what I need. I found this post at A Bouquet of Talent where it was one of the most viewed. I can see why. Just curious, there was a picture of a meal with what looked to be chicken breasts in a slow cooker with red skin potatoes and green beans. I have searched all over the website for the recipe for this meal, is it still on the website? Thanks!